Now is the time to gather all your strength and set out to forge your place in Terrinoth’s book of legends. 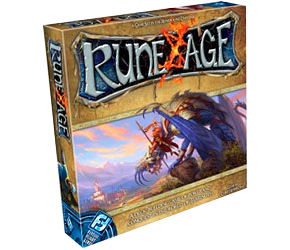 A stand-alone deck-building card game set in Fantasy Flight Games’s fantasy world of Terrinoth (also the setting for games such as Runewars, Descent, Dungeonquest and Runebound), Rune Age is driven by scenarios that set the parameters of each game, so a game can be competitive or cooperative. Players develop their decks of cards as the game progresses, playing one of the four factions first introduced in Runewars: the Daqan Lords, the Latari Elves, the savage Uthuk Y’llan, and Waiqar the Undying and his undead hordes. Each of these factions has its own unique strengths and weaknesses, and each offers a wealth of different deck-building options. A slick little design with a perfect mixture of conflict and strategy. The expansion Oath and Anvil brings welcome extra variety to the unit choices. Hi there! The file extension is missing in the link!